The StairMaster® 7000 PT StepMill® is tough - it was not designed for the faint of heart, or for those who don't want a real challenge in their time at the gym. With its unique design, multiple programs, and (20) resistance levels, the 7000 PT consistently delivers an outstanding lower-body workout along with its obvious cardiovascular training capabilities. 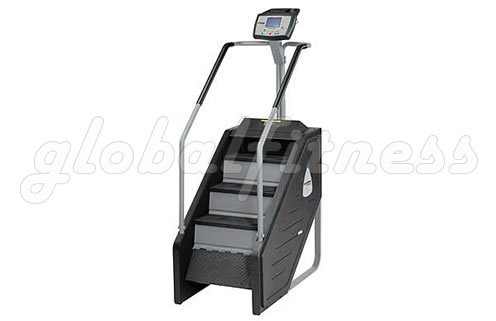 The StepMill® was one of the original climbing machines, offering 8"-high steps for exercisers to navigate, on a revolving platform that moves at a pace of 24 to 162 steps per minute, and an electronically-controlled alternator to precisely adjust the pedal descent. To monitor your progress on this life-like machine (you'll feel like you're at the stadium or in a building stairwell) there is a nationally recognized fitness test included, along with a custom firefighter test (so you know you're getting a challenge). Accessories include an easy-to-read backlit LCD display, reading rack, and a water bottle holder with tray. The 7000 PT offers other advanced features not found on earlier StepMill® models, and your workout options include: Quick Start, Manual, Fat Burner, Calorie Burner, Speed Intervals and a HR Zone Trainer. In fact, you can closely monitor your heart rate with wireless Polar® Telemetry.